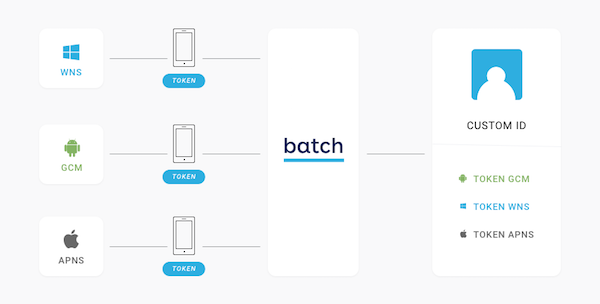 Batch can automatically tie several push tokens to a single user ID. This allows you to use the Custom Data API. This is also useful if you are planning to use the Transactional API and don't want to manage devices' tokens on your side. If you have a login system, you probably have a unique user ID associated to the user's account. Simply set this ID as your user identifier, and don't forget to reset it (by setting it to nil) when the user logs out. While email addresses are an appropriate identifier, we suggest you hash them before setting them as your identifier, for privacy reasons.